​Network Rail is a company limited by guarantee, and was established in March 2002. It is a private company with a board of directors, but does not have shareholders. It's members are drawn from the rail industry and the public. Its accountable to its customers and funded through a mixture of access revenue, paid to it by the train operating companies, and received money from the government grants. It is the monopoly owner and operator of the railway network, including track, signalling, bridges, tunnels and stations. The position of Network Rail, following two meetings in Goring with senior managers and numerous written communications, is still that design mitigation to reduce the adverse visual impact on the Goring Gap is not being considered as an option. While RAG believes Network Rail has breach the law by not having regard to conserving the natural beauty of the AONBs, NR's position is to carrying on building the standard system throughout the Goring Gasp with no modifications. 1). Network Rail did not brief it’s Swiss OHE designers, Furrer and Frey, to develop a low visual impact variant of the standard design which had regard for the highly sensitive landscape in the Goring Gap as recognized by Atkins in the Environmental Statement it produced for Network Rail several years ago. (We already know this from previous meeting with Network Rail and we believe this will be confirmed officially in the response to our Freedom of Information request on this specific subject we will receive shortly). 2) Network Rail’s own Environmental Statement (ES) produced by Atkins, highlights the OHE will have large adverse visual impact in the Goring Gap in South Oxfordshire. Network Rail has admitted in writing the design in the Goring Gap is no different to that used throughout the line, proving it had no regard for the environmental sensitivities the ES identified. We argue that this ES appears to be a tick-box exercise and once completed, it was largely ignored with very little behaviour change during the design and installation process. The stock answer from Network Rail is that it has to use this new, modern design because it is more efficient, robust, safer to build and maintain and resilient to dewirements compared with wire headspan designs, which is old technology. That could be said of the 'wheel', but we still see quite a lot of wheels being used today in modern applications. Formula One racing car wheels are one good example. So, updating other systems or designing new ones which avoid the need for bulky horizontal portals is possible, if Network Rail had the foresight to commission a low visual impact design, at least for the 2 miles or so where the line passes through AONBs. A fundamental issue is the conflict Network Rail has with trying to meet difficult deadlines (eg to complete the electrification of the 'Test Track' section of the line between Reading and Didcot, which encompasses the Goring Gap and two AONBs) by the end of 2015 and cost pressures, which could include mitigating the design of its standard infrastructure to meet its legal responsibilities under Section 85 of the Countryside and Rights of Way Act 2000), all of which costs money. 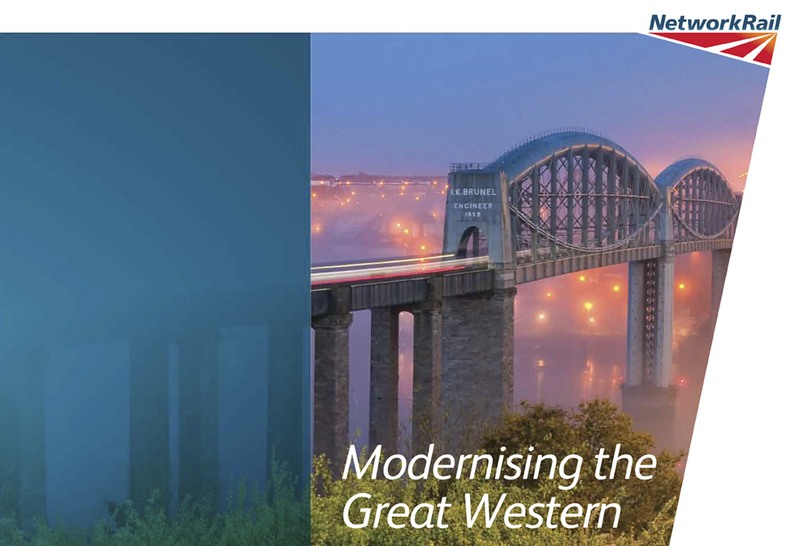 The pressure is on Network Rail to become more cost efficient and Network Rail's Management Incentive Plan 2014/15* includes 'Cutting the cost of running the British railway network by 20 per cent ...'. It is understandable that spending more money and time will sometimes conflict with meeting other obligations, including legal ones, but unnecessary environmental damage to the landscape in AONBs should never be compromised. 1) If this ‘older system’ is less reliable than the new design, why doesn’t NR have any plans to replace the existing Heathrow to Paddington electrification system used by the Heathrow Express service, which has a stated 98% reliability. 2) When RAG asked for NR for it’s comparative data to prove the new portal system is more reliable, they have failed to do so. We are not sure why this evidence is not forthcoming if, indeed, there is any. 3) Why didn’t Network Rail commission a better, more robust system for AONBs than the ‘older versions of overhead line equipment’, which NR agrees is less visually obtrusive? NR have said it is willing to mitigate, but ‘mitigate with vegetation’. However, for any planting scheme to be even partially effective to mask the large amount of metalwork being erected over the 2 or so miles of track involved, it would be a major project over many years. Any such new planting scheme would require approval by the District Council’s Forestry Department, especially as it is within an AONB conservation area. Mitigation with vegetation would require the either the purchase or use of strips of up to 4 miles of land adjacent to the track from numerous local landowners (ie on both sides of the 2 miles of elevated track in question). As of mid-October 2015, NR has not yet identified who the relevant landowners on both sides of the track are. When this process is started, there is no guarantee that the landowners would either want to sell NR strips of their land for this purpose or allow NR to plant inappropriate species in the open Chilterns, such as tall, perhaps evergreen, trees which would be needed to provide effective year-round cover. “Our Biodiversity Offsetting scheme is just getting underway. We have provided briefings for our local authority contacts and are also undertaking initial individual scoping meetings with a number of councils. The scheme will be led by a dedicated project manager, who is unfortunately not yet in post. We are therefore commencing the scoping and initial planning work through the existing Environment team. We therefore do not yet have a timetable for any planting works. This will be developed with the landowners involved, and will depend on the type of planting to be undertaken. We will also be appointing appropriate contractors. The ‘end date’ will also depend of the specific planting schemes, as there may be an element of maintenance required to ensure the planting is properly established”.